Did you know that every email message sent to Academy Personnel or your Team or your Department or ANY Google Group are all stored forever in the Google Group Archives? You can access the Archives and find any and all old messages…here is how! Finding files in Google Drive can sometimes be challenging. A few built-in shortcuts may help you navigate your files more efficiently – Recent and Starred files. Spinning Beach Ball? Documents, Photos or Applications not opening? Phone not acting normal? Here is a quick fix… RESTART! 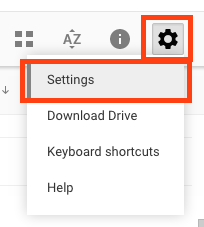 Make sure the “Convert Uploads” checkbox is checked and click Done. Now anytime you upload a Word, Excel, and PowerPoint file, it will automatically be converted to the Google format.